"I, for one, welcome our new insect overlords. I'd like to remind them that as a trusted [comic book writer] I could be helpful in rounding up others to toil in their underground sugar caves!" Look, boss: I'm on message! I'm a Company Man! honestly... it's getting to the point where I don't care what they did to steve (I still believe he was either replaced by Ultimate Cap, or they split him into two, one side his dedication and tactical skills, the other his innate good heart and willing to defy authority for good) but not only is HE being dragged through the mud, so is every other character. Also, the last time we saw PymTron, wasn't her better? and does he know about Natalia? Splitting Cap like Star Trek's "The Enemy Within." Interesting. After all, the "evil" Kirk had the drive and determination. "And what is it that makes one man an exceptional leader? We see here indications that it's his negative side which makes him strong, that his evil side, if you will, properly controlled and disciplined, is vital to his strength." No. 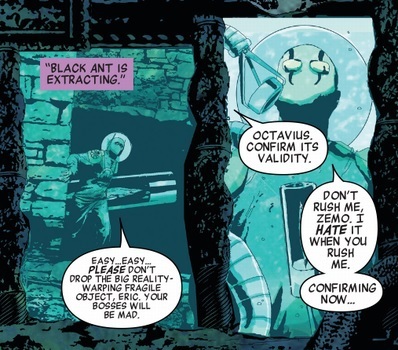 The end of the Pymtron arc in Uncanny Avengers revealed that he wasn't actually Hank at all and was purely Ultron pretending to be Hank and wearing his skin in an attempt to kill the Avengers. And they didn't mention Nadia to him in that arc, that may mean it took place before she was introduced or they wanted to hide her existence from Ultron. Who else is being figuratively dragged? Goodness, no; by the time The Man Who Fell To Earth started, Ultron had all but killed Hank Pym and puppeted his corpse around like a meat suit, went on a genocidal rampage across the cosmos and pointed the survivors to Earth should they want to take revenge on him. In the end, he was thrown into the sun but was rescued by what little Hank there was left. Re: Who else is being figuratively dragged? 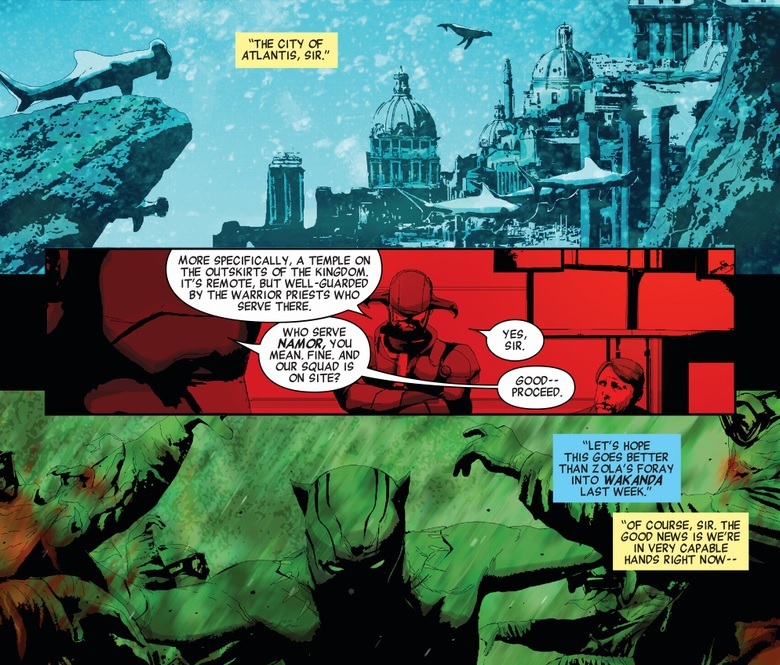 In Rage of Ultron, Ultron took over the planet Titan and piloted said planet like a ship, infecting evrything he could find à la Annihilation: Conquest. 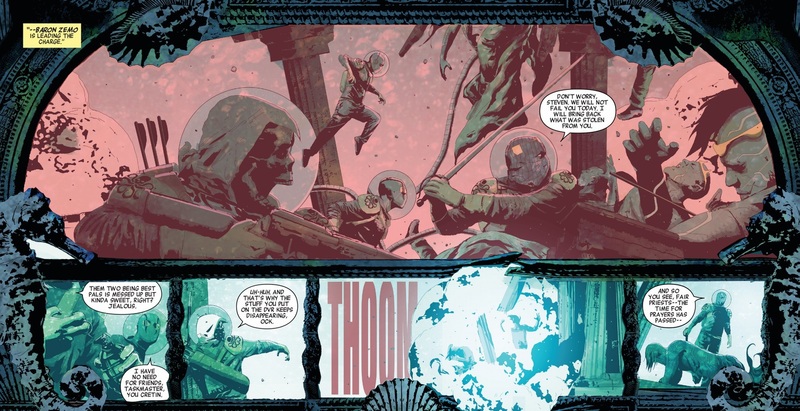 After an accident with the Vision in an attempt to stop Ultron once and for all, Hank Pym ended up simultaneuosly infected by and merged with Ultron. no, I know that part. it was the meat puppet part I was terrified about... why would Hank save him... I mean I suppose there was part self preservations as well. By the end of the story, Ultron had a bit of an identity crisis: he's not sure anymore if he's Hank Pym, Ultron, or both (he first claims that he's Hank Pym and has mastered Ultron, then when his cover is blown he claims to be a hybrid of the two. 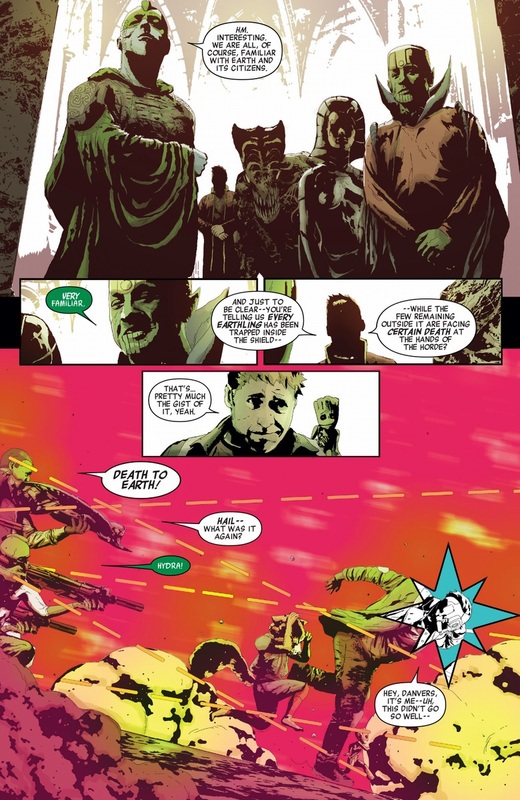 Vision tricks him into admitting Hank is apparently dead, and his inner monologue shows he doesn't even know himself if he's Hank Pym under Ultron influence or Ultron under Hank Pym's influence). I loved that the Vision did that to give Jan some closure and save her agonizing over "what if?" 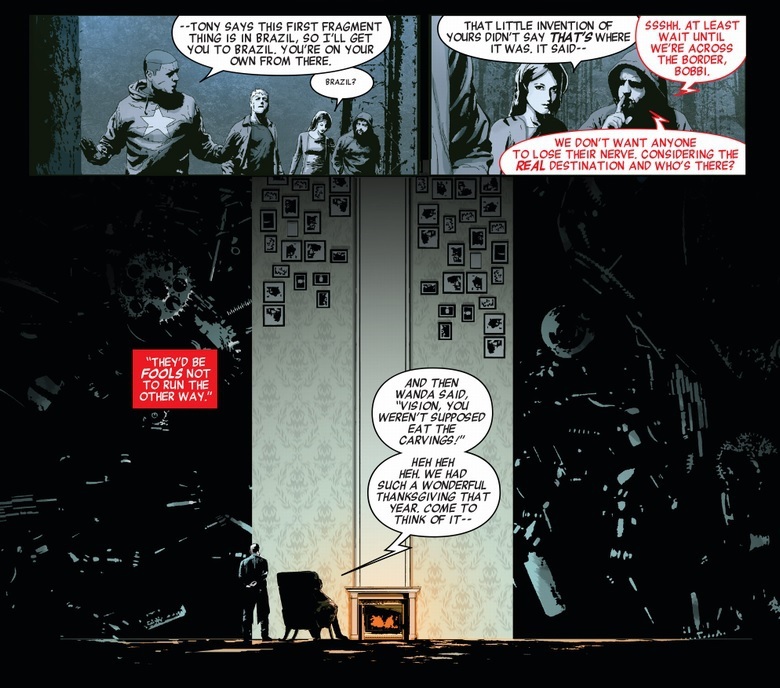 scenarios about some remnant of Hank trapped within Ultron. 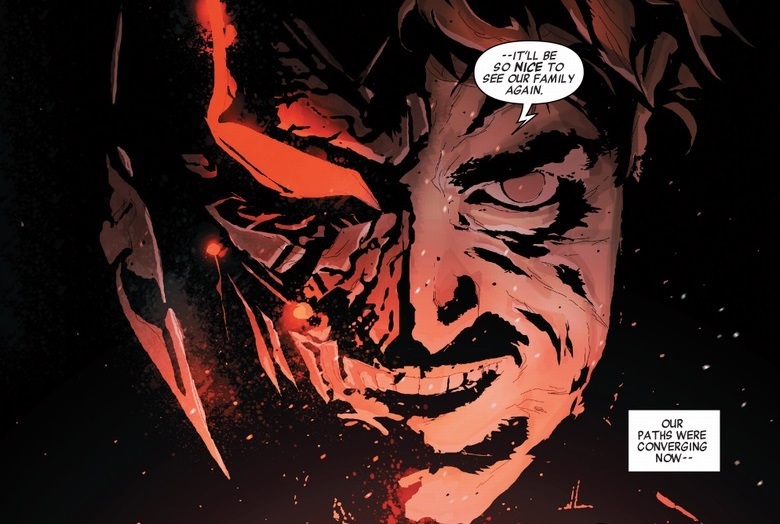 UltronPym and Nadia haven't met and the last time we saw Ultron Punisher, he was still a villain. I still say that Evil Cap should turn out to be a robot made by Reed Richards. Considering Mr. Fantastic's history of acting like a colossal jackass, I could actually imagine him pulling something like this just to see what would happen. 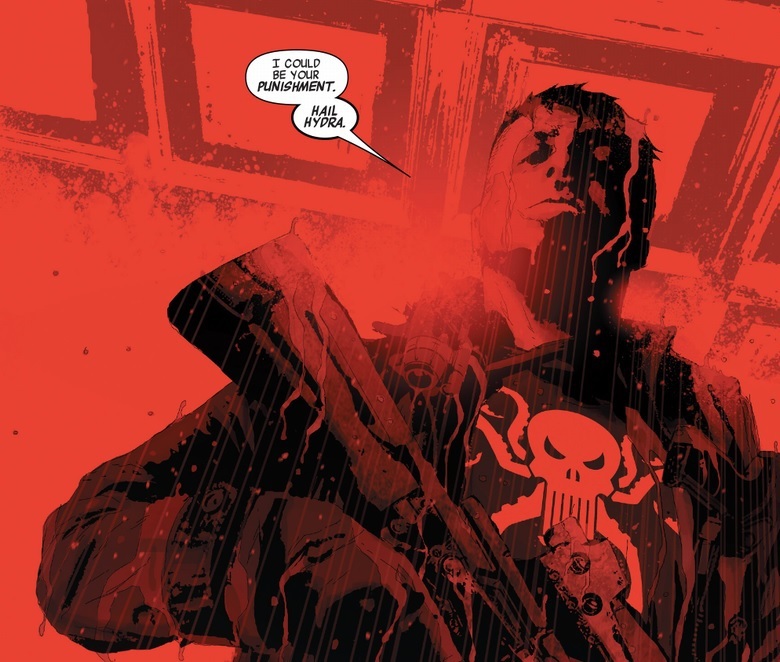 Oh, and Punisher joining Hydra? Not actually a bad idea. Considering his world view boils down to "Shoot people I don't like." He actually fits in quite well with that group of fascists. Unless you mean the Maker, i don't see how that would make sense. 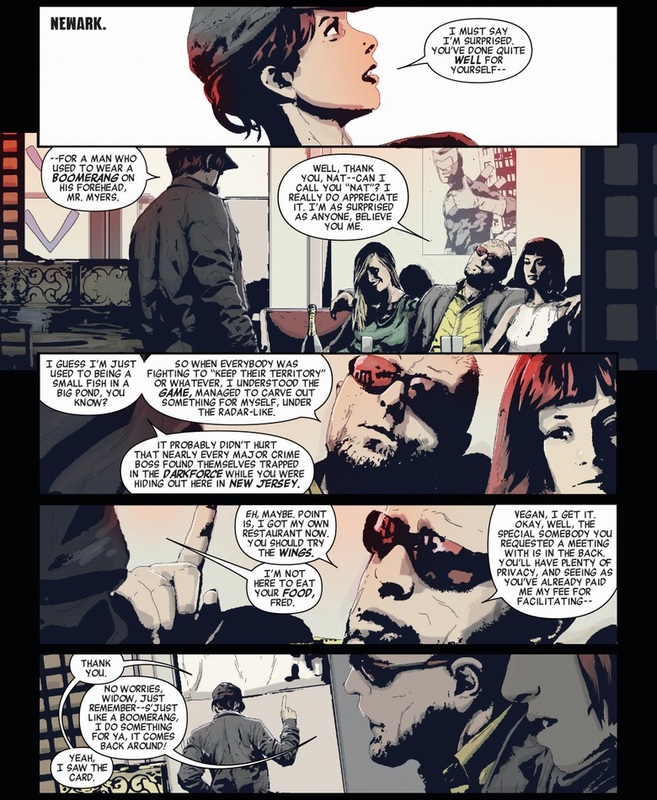 616 Reed is of recreating the multiverse with his family. Speaking of Reed Richards, anyone suppose they'll have Ultimate Reed/the Maker involved in all this? He seems like the type who could go either way: join Hydra to be with his fellow baddies, or cause his own brand of mischief on the side. 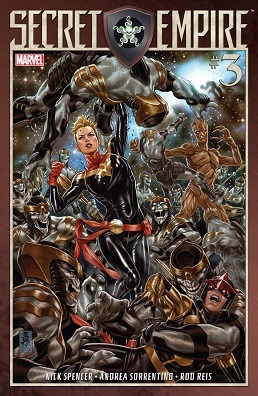 It's kind of funny, I love the GotG movies but I still roll my eyes when I see them shoehorned in events like this. They're not even trying to hide the photo reference for Rocket here. I loved the scene with the aliens. "So, you're saying all the superteams who've humiliated our various star empires time and time again are trapped in a bubble, and you've come here with no backup to ask for our help? This feels like an early Plurgmas!" Herc saying "What about the Captain?" : for a moment, I had hope that Captain **** was going to come and save the day, finally getting to even the score with Rogers by giving him a thrashing. He's appeared recently! HE COULD SHOW UP! 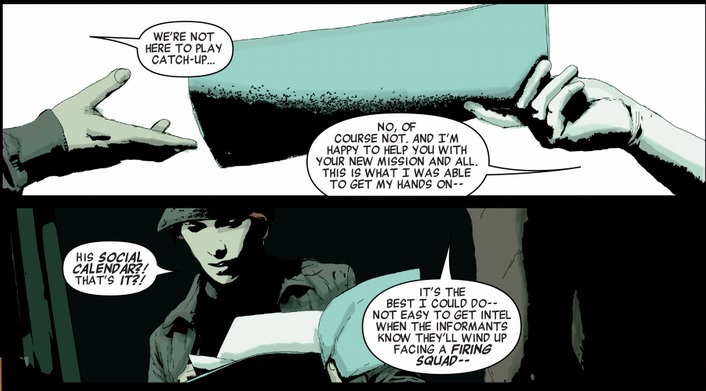 Even when Maria Hill is right, she still manages to be wrong. Provided no one hits the reset button, I wonder if she's going to suffer any consequences over murdering American civilians. 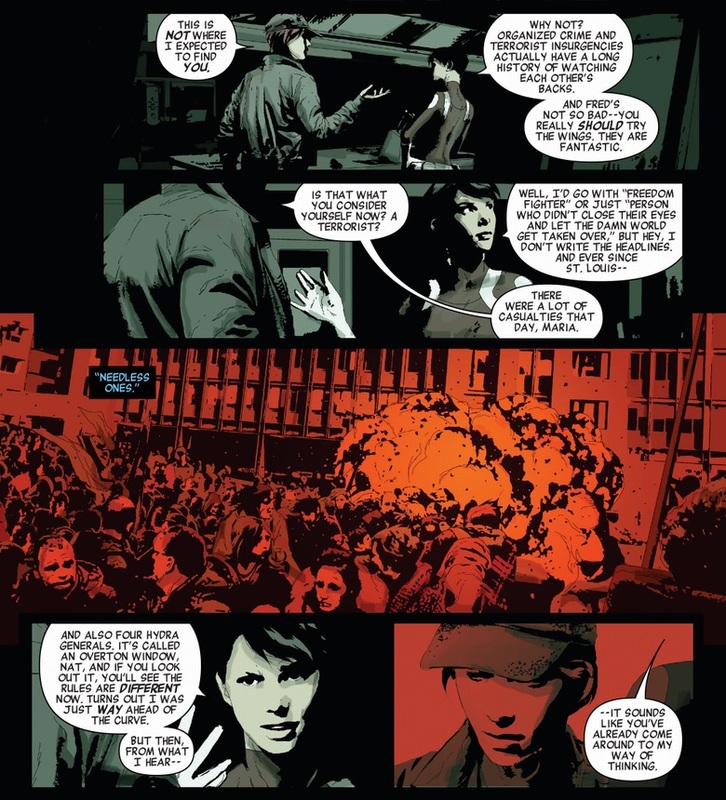 That, or Nick is setting the grounds for "the supposed good guys are actually being worse than Hydra now, Hydra are the new good guys, as they should have been all along"
This is still garbage and I'd like exactly zero of it. What are you talking about? 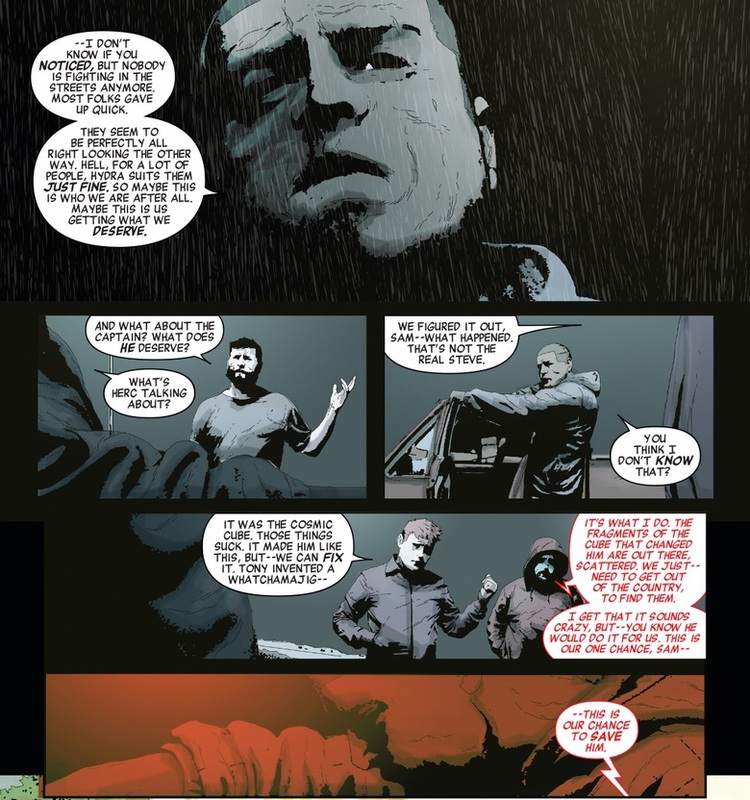 HYDRA are still the main antagonists of the book - heck, the presence of the other Steve Rogers from #2 should have given that away if the months of setup didn't already. Where did this idea of "Nick Spencer is/condones fascism and Nazis" come from? Oh no, Cap now has a grainy washed-out muted-color picture on his side! I don't think Alan Tudyk is the best face model for Sam Wilson, TBH. Wait, I thought Atlantis had a neutrality treaty dead which they don't provide sanctuary and they don't have to put up with stuff like this? What, you were actually expecting the editorial staff to keep track of what's going on across ninety comics? You were expecting cooperation and coordination? Pffft. Honestly I expect Spencer doesn't care what's going on outside his own comics and he's writing whatever he feels like. Parallels perhaps of Nazi Germany's various assurances of neutrality. "Yeah, hey, we're gonna roll up your neighbor real quick, but don't worry, we're not gonna do anything to you. Not until we see you have something we want, anyway. Hold on, did I say that last bit out loud?" Quite. HydraCap is trying not to overextend by fighting Mutants and Atlantis at the same time he's fighting Inhumans, buuuut, yea, Hydra cannot be trusted for beans. 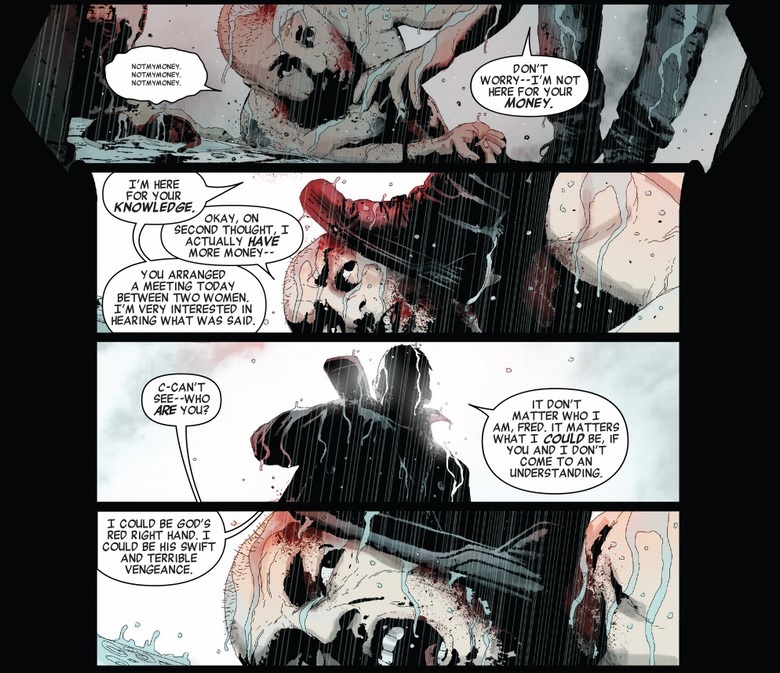 That Namor story is part one of multi-parter, so maybe by the time it ends Atlantis is no longer neutral, and it all takes place before this scene. Or maybe this is Cap breaking the agreement because Cosmic Cube is priority one and there's no way Namor's going to voluntarily hand it over. I hope Nat gets to try the wings! 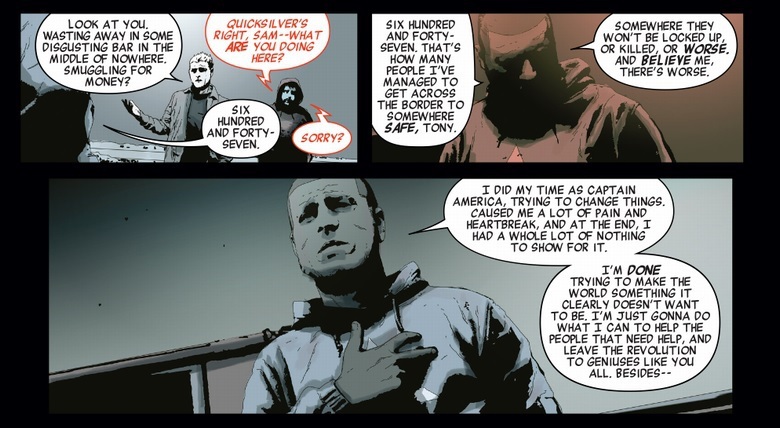 Did Sam Wilson get a really harsh beat down? His face almost looks caved in. I have to admit, now I'm really curious about the wings. Also curious where Tony and pals are headed/who that was. The description they give of Steve/Zemo is pretty spot-on. I hope it lasts somehow, like after Cap is restored, Zemo tries to get the "real" Cap, his Cap back. Heck, it practically writes itself as an inversion of what the readership has been feeling for a while now.